A collection of digit styles for use with HTML counters or clocks (or whatever else you can think of to do with them). What is new? New Fonts! GIF images may be saved directly. They include the width of each digit in the comment, as needed for some counter software. PKZip compatible archives and GZipped Tars of the individual digit files and the strip are available on all pages. Individual digit files are in the zips and are ready to work with my counter or my clock. WARNING: These pages are graphics intensive. If you have a slow link, you might become impatient. Contents: This is the complete list of all the sets available here with links to view only the one you are interested in. What's New: Find out what I have changed recently. New Fonts: A graphical index of what fonts have been added in the last 90 days. FAQ: Frequently Asked Questions and the answers about this site. Style Pages : Designed for browsing. All: All the styles collected on one page. Digital: These look like they belong on a computer. Odometer: You know, like in your car. Font Fount: Functional but stylized. Holiday: Use these around the holidays to show your spirit. Symbolic: Usually dots equal to the number. Non-Arabic: Digits for and from other languages. Useless: So strange, you may not want to use them. Collections: Pages which are composed entirely of the work of one artist. The Leonard Arzoomanian Collection: Styles focussing on holidays, but not exclusively. The Yoshiaki Hagihara Collection: Very creative. Good concepts and execution. The Hironobu Kanno Collection: A good mix of styles. The katt Collection: An incredibly artistic collection, all by one artist. The Benjamin C. King Collection: Same basic style but with a variety of colors for backgrounds. The Pierre Mengal Collection: High Tech. Execution is superb. The Hart Wheeler Collection: Excellent font choices presented on both White and Black backgrounds. 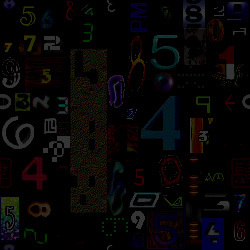 Everything: All there is on this page is a link from which you can download an archive of all the digits. Software: Here you will find a list of all the programs that I know about who can use these digits. Alphabet: This page contains links to sites which have graphical letters available for download. Awards: Recognition for this page (not much so far). Ad Info: Do you want to advertise on Digit Mania? This tells you how. For Macintosh users, here is an unzipper for the Zip archives. Thank you Info-Zip. Mail me (kda-digitmania (at) birdbrain (dot) net) if you have more digit GIFs.